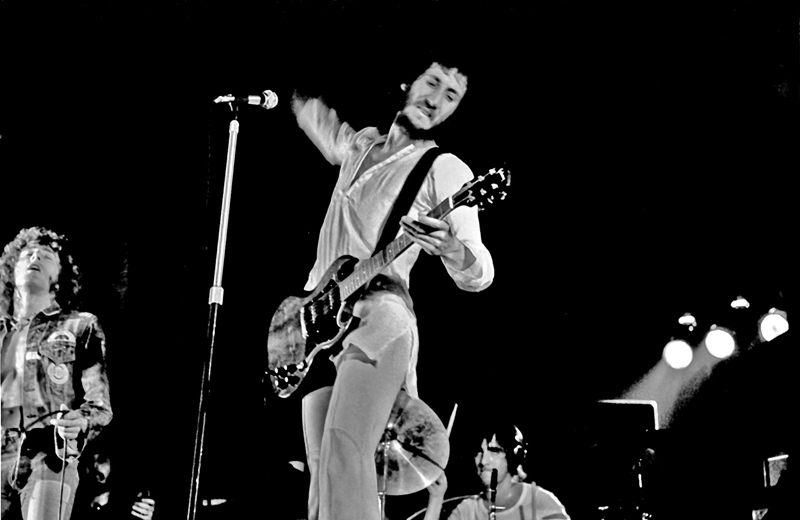 The Who’s achievements are many, and the one common factor that has propelled them for more than half a century is rock ’n’ roll’s finest right hand: that of Peter Townshend, arguably also the owner of popular music’s keenest brain and the creative force behind a group that remain one of the world’s most popular live draws. Anyone who has seen The Who recently will testify that even at 70, Townshend has lost none of the fire that’s made him such a compelling performer over the years. 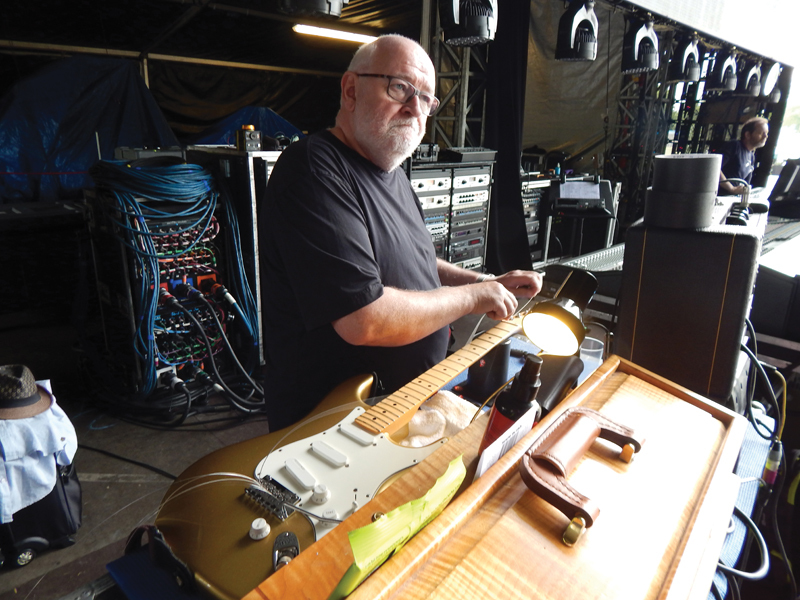 Having also worked with The Rolling Stones, Joe Walsh, Eric Clapton and George Harrison, there’s very little that Townshend’s guitar tech, Alan Rogan, hasn’t seen. We meet at Hyde Park’s Gate 10, as Alan has agreed to allow G&B a close look at the guitars used by his current employer, ahead of The Who’s headline peformance to 70,000 people at British Summer Time festival. It soon becomes apparent that preparations for a gig of this magnitude leave nothing to chance. As Alan leads me to the festival’s Great Oak Stage, you would be forgiven for thinking that NASA is about to launch a space probe: there’s high-tech equipment everywhere and security is tight, but it’s par for the course in the run-up to a performance by one of the world’s greatest live bands. I am taken immediately to a huge flightcase that contains eight Fender Stratocasters encased in thick foam supports that pull out like drawers. The first guitar I see is the Torino Red Strat (number 4) that Townshend has been using since 1989. He typically has four to six more of these, and all are Eric Clapton signature models. There are numbers on the back of each guitar to indicate which instrument Townshend will use during certain points in the set, and for capo use. 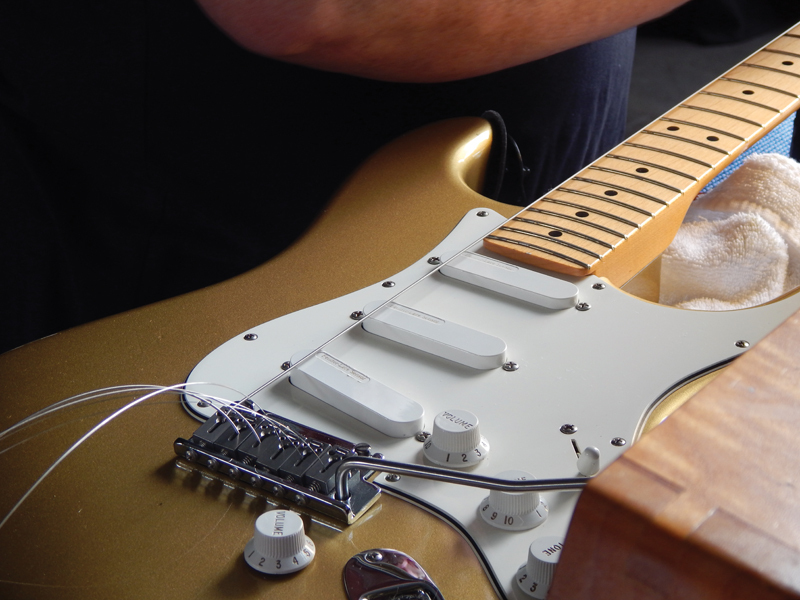 We walk over to a workbench that is full of tools and lay down the Strat. A Peterson Strobe Center 5000 tuner is situated in front of us; there are no pitch pipes here: this is serious tuning tech for the big boys! In addition, there’s a small Vox amp with an eight-inch speaker for Alan to plug the guitar into. Underneath the bench are plenty of small drawers, with just about everything a top guitar tech could need. 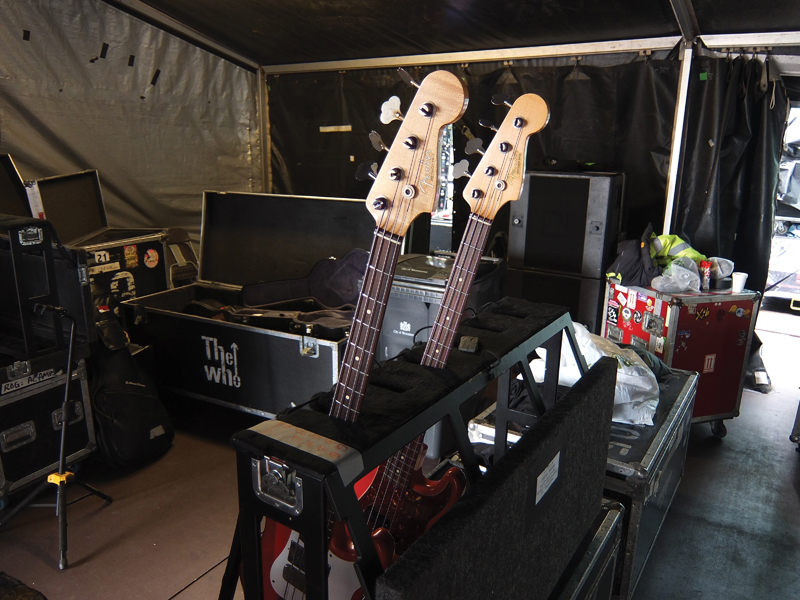 As Alan strings the guitar up, he tells me that Townshend now uses 10–48 Ernie Ball RPS Slinkys. Alan removes the bottom string from a 10-46 set and replaces it with a 48, which he says Pete prefers. The guitar is basically a stock Eric Clapton model, with the notable addition of a Fishman Powerbridge. A volume control sits behind the treble side of the bridge and controls the output of the piezo ‘acoustic’ signal. 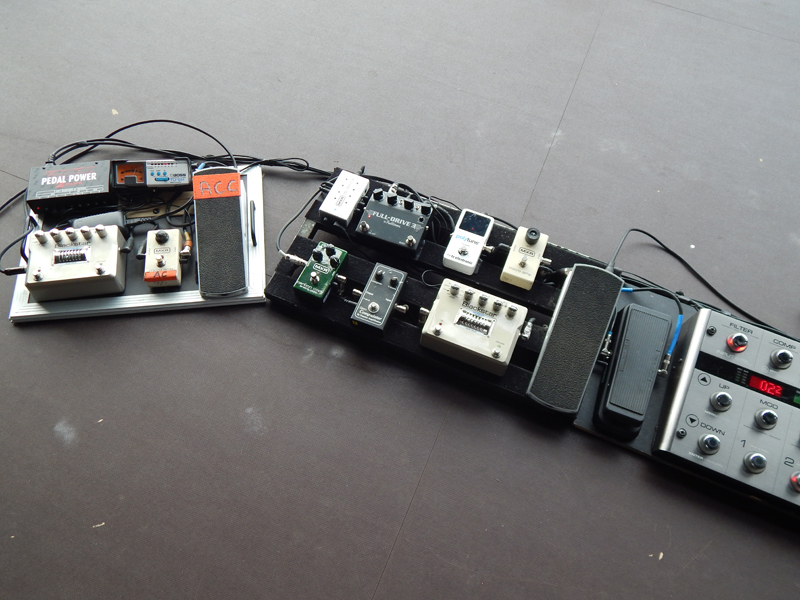 Alan was directly involved in this layout and the components, which send a stereo output to a Pete Cornish splitter box that also includes the signal from the guitar’s Gold Lace Sensor pickups. On the back of the guitar is an EMG preamp, which boosts the signal from the ‘acoustic’ side, that goes directly into the board. This combination provides an unbelievably good sound, with such punch and acoustic clarity: it’s the best I’ve heard. 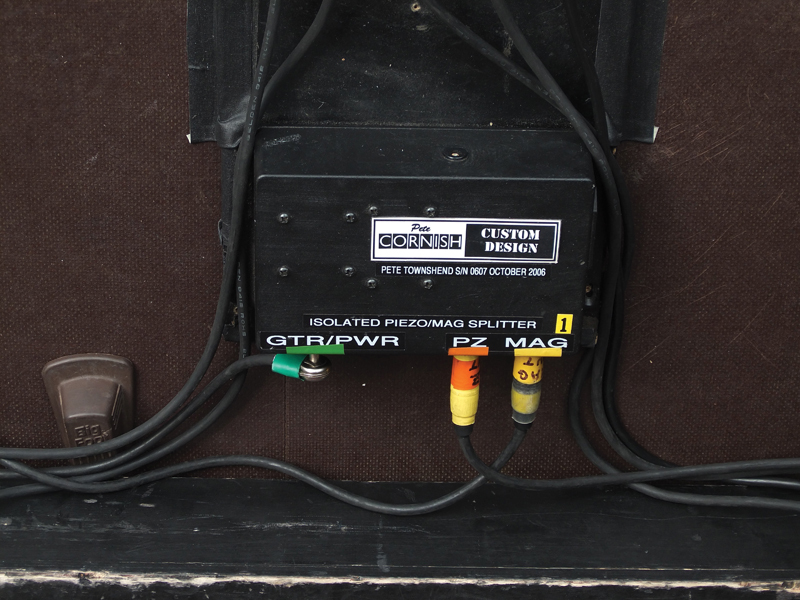 Out front, near Pete’s monitor, there’s a footswitch conveniently labelled ‘Big Fat Switch’ which enables him to shift between the sound combinations. This guitar has a 42mm nut width, and the slots for the strings have been cut impeccably – as you would expect on one of Townshend’s guitars. On the top horn of the guitar’s alder body, I see many scratches on the surface in the area where he plays most of his fast rhythm parts. The Gold Lace Sensor pickups deliver a midrange emphasis with a resistance of 5.8k, complementing the Fishman’s piezo tone perfectly. 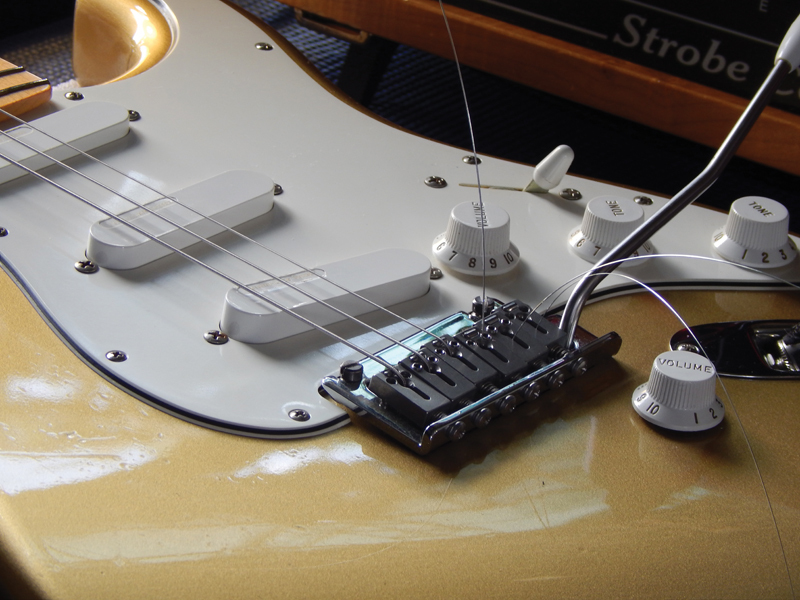 Designed by Don Lace and launched in 1985, Lace Sensor pickups are equipped with a ‘radiant field barrier’ system, that surrounds both the coil and magnets and helps reduce 50/60 cycle hum. True single coils, the idea behind Lace Sensors is that the barriers help to concentrate the magnetic field, meaning that lower-strength magnets can be used. Weaker magnets mean less string pull which in theory translates into an increase in sustain and more accurate pitch and intonation. The Lace Sensor Golds, which date back to the first-generation Eric Clapton Signature Strats that were introduced around 1988, are Townshend’s preferred Strat pickups and are vintage-voiced with a great midrange. The guitar is finished in a thin skin nitrocellulose lacquer, which allows more resonance than a modern poly finish and contributes to the acoustic quality. The scale length is the expected 648mm, with 22 frets and Sperzel locking machineheads. 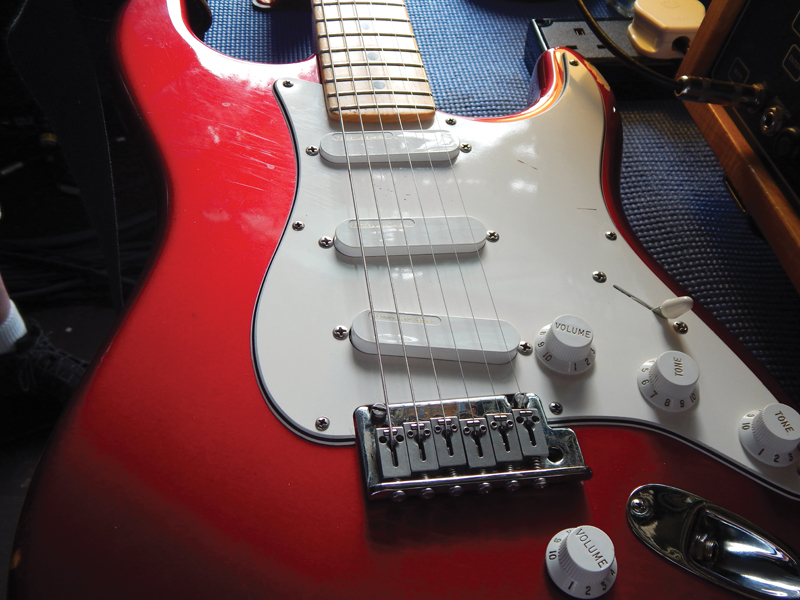 The first Clapton Strat prototypes (1986-87) had 21 frets and a 25dB midrange boost. The bridge width is 52mm on two pivot screw posts, with two trem springs around the back. 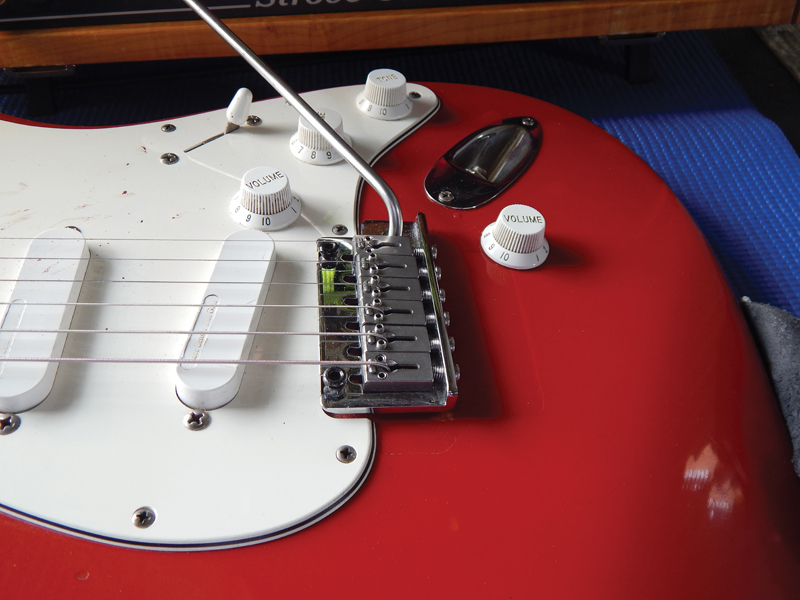 The vibrato is set for a semitone pull-back, and the action is perhaps high for many Strat players, but for Townshend’s playing technique and power you wouldn’t want it any lower. Big Bends Nut Sauce is put into the slots before Alan strings the guitar up. Once he has pre-stretched the strings, and after locking them, he then tightens the machinehead screw to keep everything as tight as possible. The strings are not cut after passing through the machineheads’ string posts until the next day’s final tuning has taken place. Early versions of Townshend’s EC Strats had a Kahler locking vibrato, but now everything looks a lot tidier: I never did like the locking nut stuff! The frets have a little wear, but don’t need a fret dress. The bridge saddles on the Fishman have the top E saddle set lowest, with the B slightly higher than would be expected – with the G and D set the same. The A is set lower, with the bottom E slightly angled: it is quite interesting looking at this layout because it reflects the style and feel of the player. I notice that from about the 17th to the 22nd fret area, the edge of the maple fingerboard is darker, and has worn through where the pick hits it when Pete is playing rhythm parts. 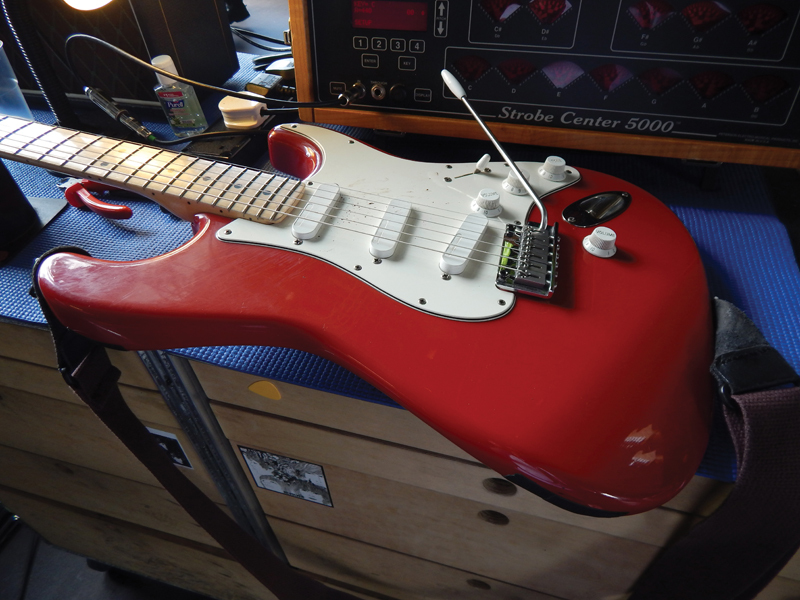 Next out of the drawer is a Candy Apple Red Strat with number 8 on the back: again a Clapton signature model with Gold Lace Sensors. It has the mid boost and TBX tone circuit and a three-ply white/black/white pickguard. This guitar was used on the Quadrophenia And More tour during 2012-13. This number 8 Strat was also used for the Dublin gig two nights before, and it too has Pete’s blood on the scratchplate and strings at the end of the fingerboard. 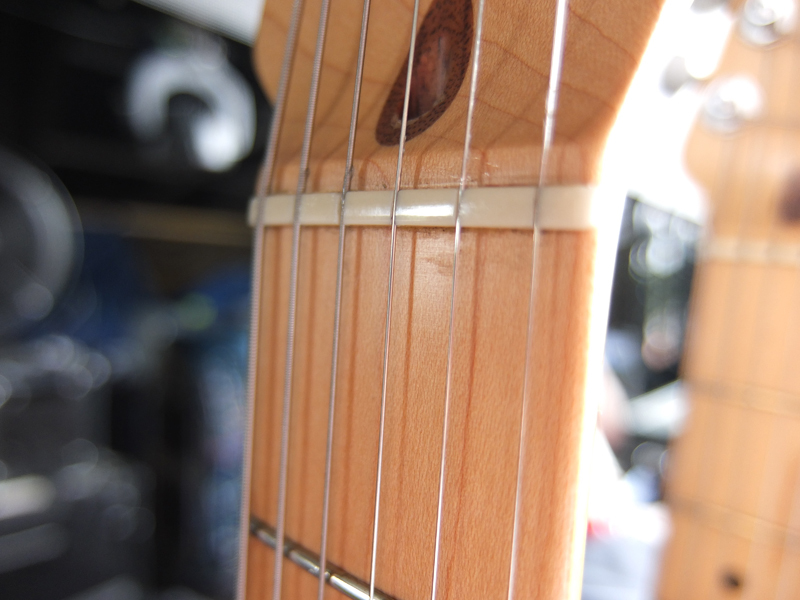 The edge of the fingerboard at the bass-side 19th fret has some wear, but is not as worn as the Torino Red Strat. 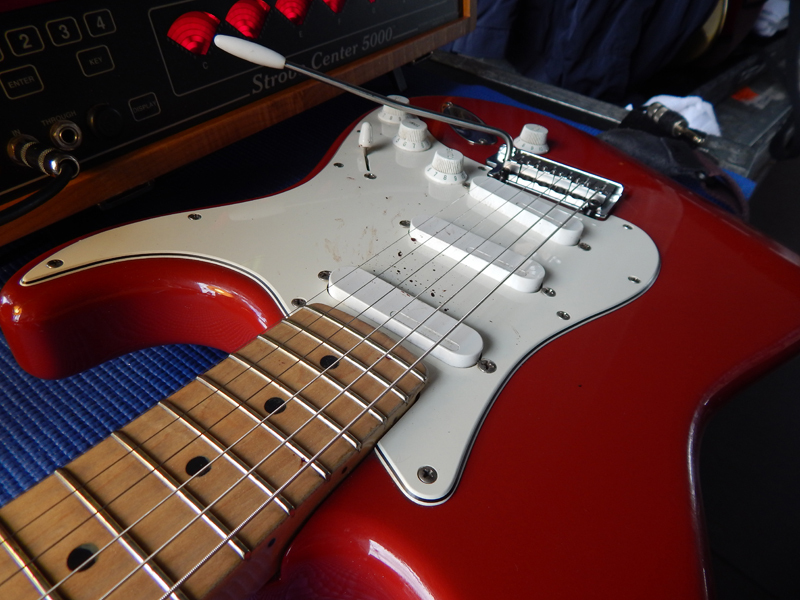 Scratches are still evident on the lacquer above the neck pickup and the top edge of the guitar, where Pete’s arm would rest, has some lacquer chips, but the guitar is actually in good condition considering the owner’s reputation! Sperzel locking machineheads with staggered tuning post heights are fitted with a butterfly string tree for the B and E strings. The G string’s chrome machinehead has been replaced and a satin-finished tuner has been fitted in its place. Some damage is evident on the headstock, but it is not extensive. On the back of the guitar, there is a Fender Custom Shop four-bolt neck plate, that has a serial number starting with CZ. The C represents Custom Shop and the Z represents the decade, meaning zero – so appearing after 2000. The bi-flex adjustment hole can be seen below the serial number. Once again, the action is quite high, while the frets are vintage-style. 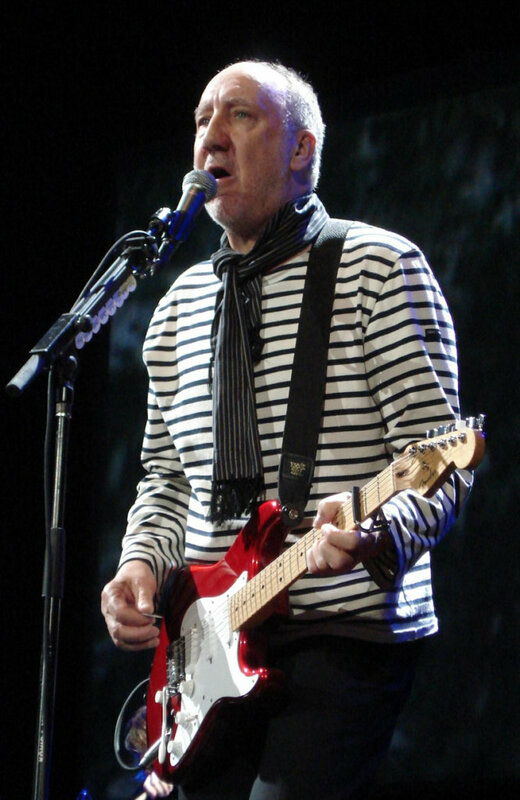 Townshend also used a Candy Apple Red Strat with a single-ply, white scratchplate around 2007. In 2004, all Custom Shop Clapton Strats that were both Team and Masterbuilt used a standard tone control instead of a TBX tone circuit, which was reinstated around 2009 but only on the Team-built versions. Interestingly, on close inspection it’s noticeable that the 22nd fret overhangs on the treble side of the fingerboard, and you can see the tang under the fretwire as though it had not been trimmed when the guitar was fretted. It is, though, in my opinion the best of the three guitars. There are no major dings, although inevitably, some surface scratches are visible. The vibrato, like the others, looks set for a semitone pullback. The B-string saddle is set higher, as on the other two Strats. All of Pete’s Stratocasters have the Clapton signature decal rubbed out because they are no longer Eric Clapton signature models in the true sense. The black Strat that fans may have noticed at Hyde Park has 10.5-gauge strings fitted and is used for the song Love, Reign O’er Me. It is tuned half a step down. I don’t see this guitar during my tour, but Alan says he always has around 16 Strats ready and waiting in the wings when The Who are on tour. A couple of them were custom-made for Pete, and the black model dates from 1992. 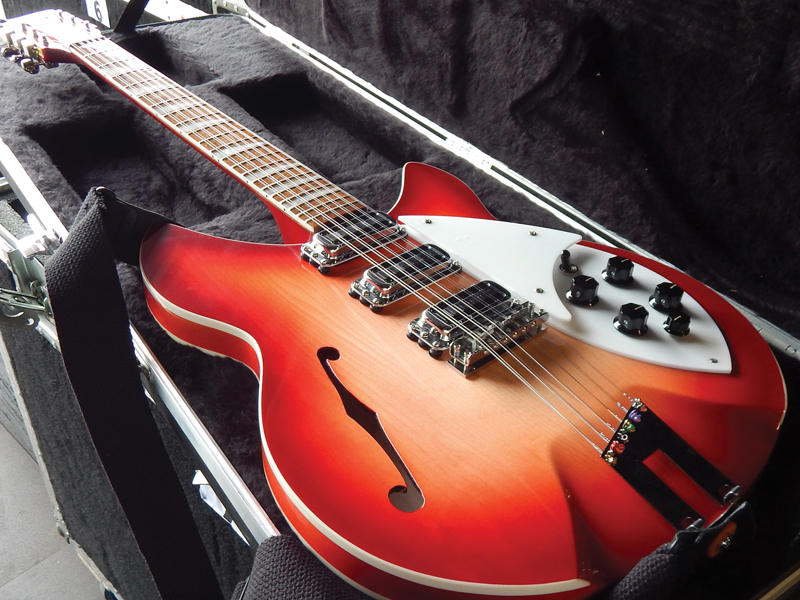 Later in the day, at the back of the stage, Alan invites me to look at one of two Rickenbacker 12-string guitars that were sent to Townshend. The Fireglo finish is stunning to behold, and as I put my hand around the neck I note that it has a really slim profile, especially around the first-fret area. The model is called the 1993 Plus, and is an update of the model he used in the sixties that was exclusive to British distributor Rose Morris. The two-piece neck has been widened by 1/8th inch (3.1mm) and the fingerboard is made from Caribbean Rosewood. It has three vintage reissue ‘Toaster’ single-coil pickups, a stereo output and a trapeze tailpiece that catches all 12 strings; the close proximity of each pair of ball ends is thought to improve the tone. As I walk over to the backline to have a look at Pete’s amps, there’s a playback of the band from the Dublin gig coming through the monitors and Pete’s guitar sound is isolated on the track Who Are You. The tone of that guitar is beyond a simple explanation, but I want one nonetheless! I am introduced to Tim Myer, who takes care of Pete’s backline. 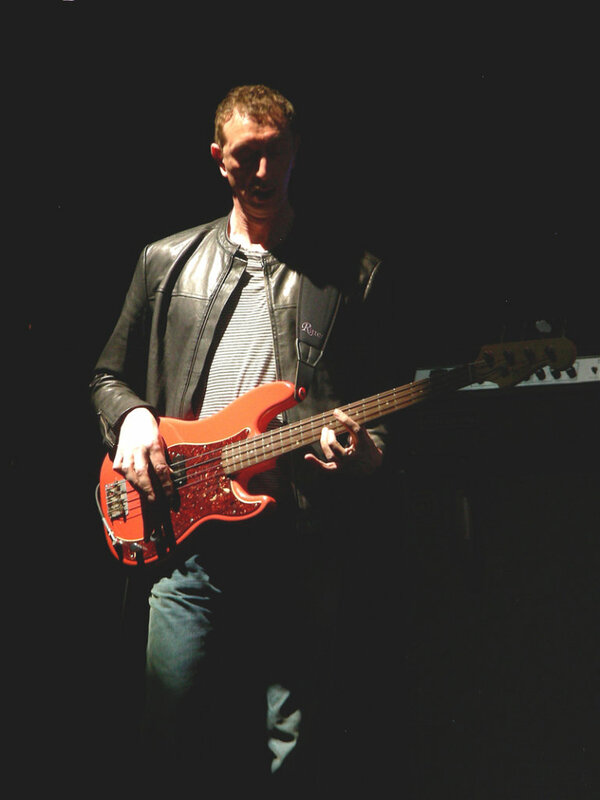 Tim works with numerous other major acts, from Jeff Beck, Roger Waters and G.E. Smith to Snowy White. 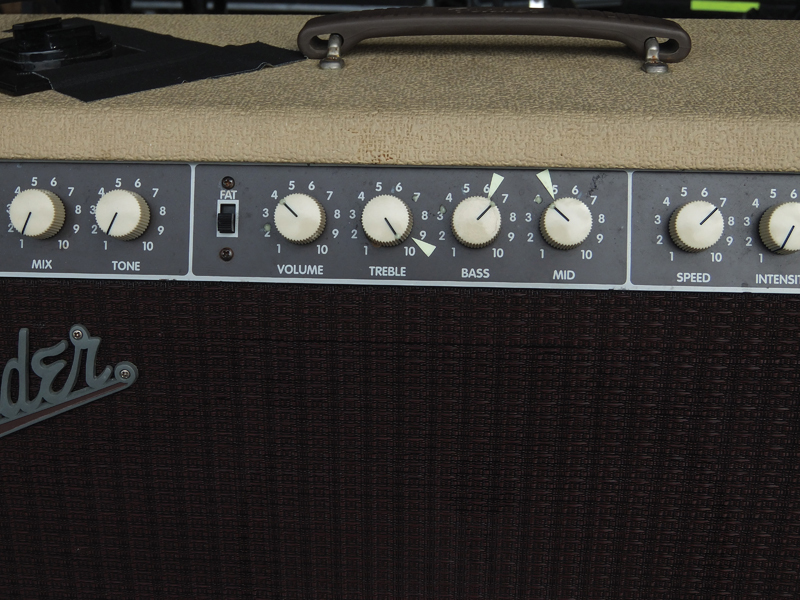 Looking straight at the rig, Pete’s main amp is a Fender Vibro-King 60-watt combo in blonde with an Oxblood grille cloth. It has a trio of the earlier 10-inch Eminence blue frame Alnico speakers fitted, and sits on top of a Fender 2×12 cabinet. In the middle is a Vibrolux Reverb combo with 2×10 speakers, on top of another 2×12 cabinet. The Vibro-King is 22.5 inches in height, 24.75 inches wide and 10.5 inches deep, weighing 72lb. 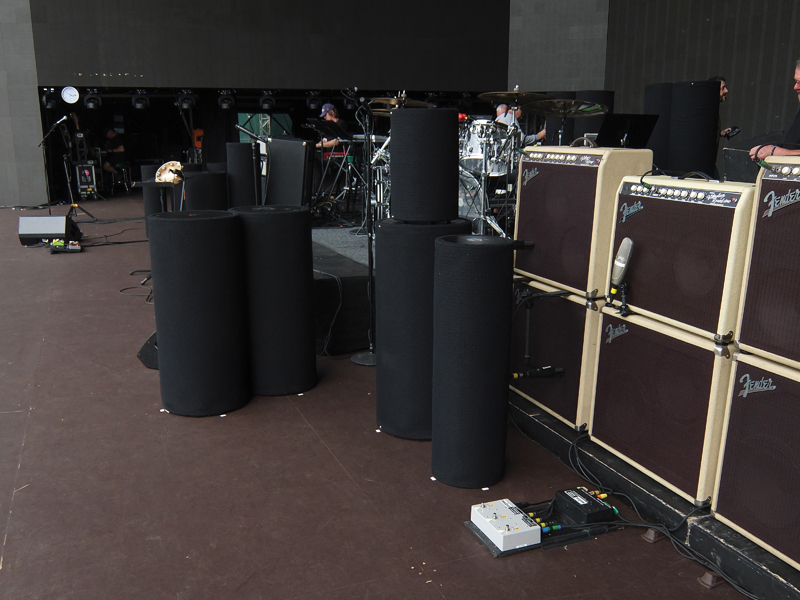 Next to that is another complete Vibro-King set-up, which is brought into use at the end of the show, usually on Won’t Get Fooled Again, but the settings are lower than the main amp. This is about as high as Townshend’s volume ever goes! 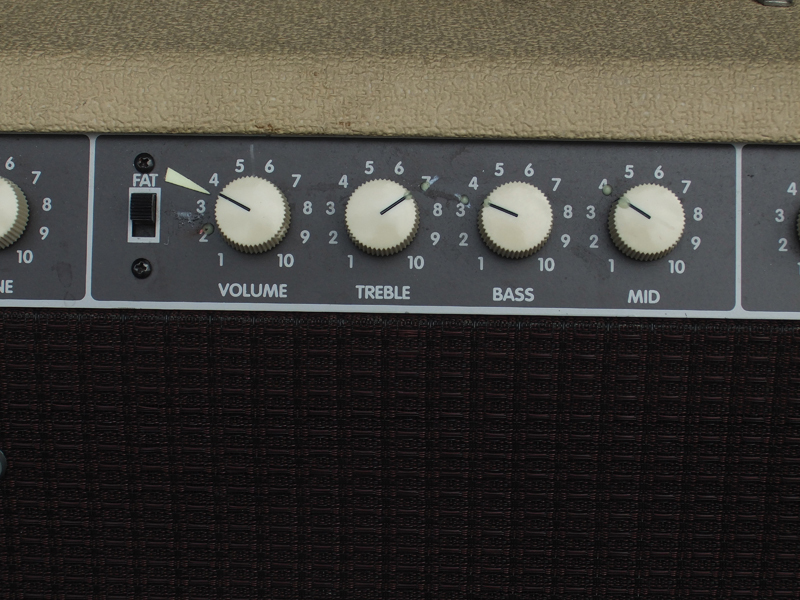 Townshend’s main amp has a piece of tape to indicate where the volume should be set, and I was amazed to see it around number 3! The treble is set at 7, the bass is just over 3, and the mid is at 4. 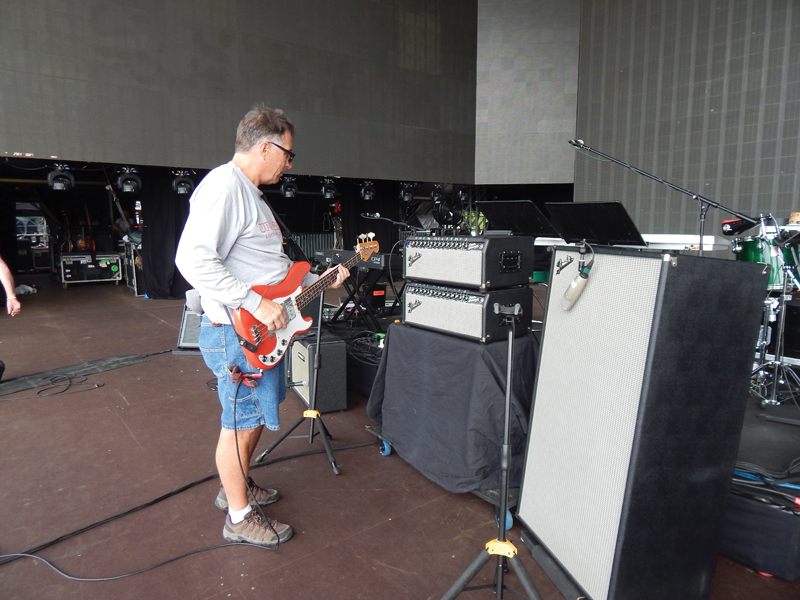 “Usually, at some point in the show Pete will turn the volume up to about 3.5 on his main amp, but not much higher than that!” Tim tells me. The Vibrolux has the inputs covered with black tape on the normal channel, but a lead is coming out of the bright input channel. 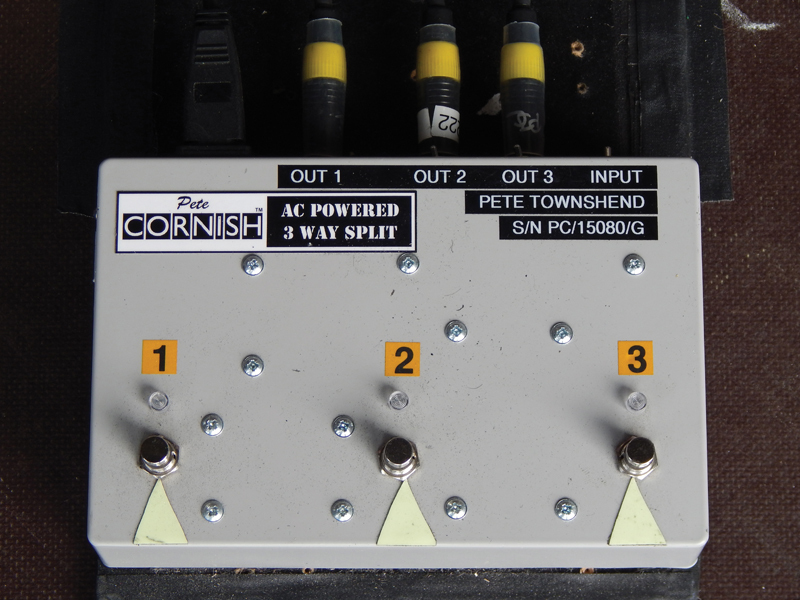 As well as the spare Vibro-King, there is a Pete Cornish splitter box that is marked ‘Pete Cornish Custom Design, Isolated Piezo/mag splitter Pete Townshend S/N 0607 Oct 2006’. This is the box used to blend the Fishman Power Bridge piezo pickup and the Gold Lace Sensors. It’s a stereo set-up with huge tonal capabilities, and Pete just dials in what he wants. 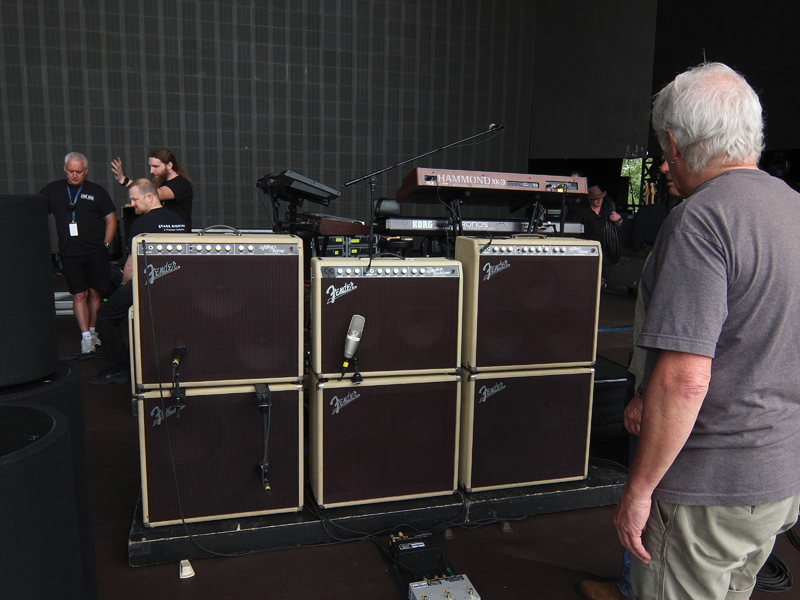 At the back of the rig, there are two more Vibro-Kings and another spare 2×12 cabinet, that are switched on during a gig; and the amps have the settings the same for any sudden changes needed due to front-line failure. Everything is designed for minimal disruption, so switchover can be as efficient as a Formula 1 tyre change. 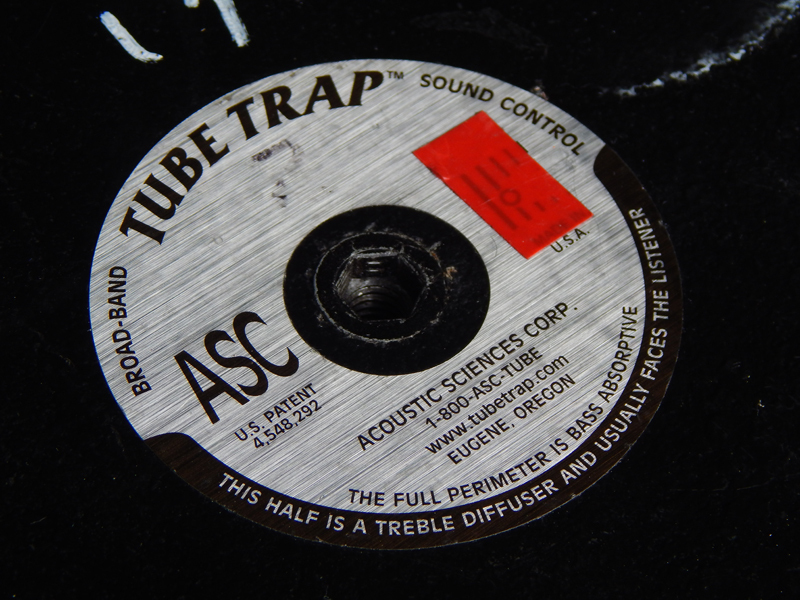 Myer also brings out the TubeTraps, bass traps made by Acoustic Sciences Corp, invented by Art Noxon. On the top is written, ‘this half is a treble diffuser and usually faces the listener, the full perimeter is bass absorptive’. I contact Marcus Thompson from Acoustic Sciences, who very kindly directs me to Chris Klein, the company’s studio acoustic specialist. Klein was directly involved with setting up the TubeTraps for Townshend. He tells me: “Pete has used them in his studio for years. When I was working with Zak Starkey, and involved in his stage set-up, Pete was interested to know how they would work with his own stage amp set-up. 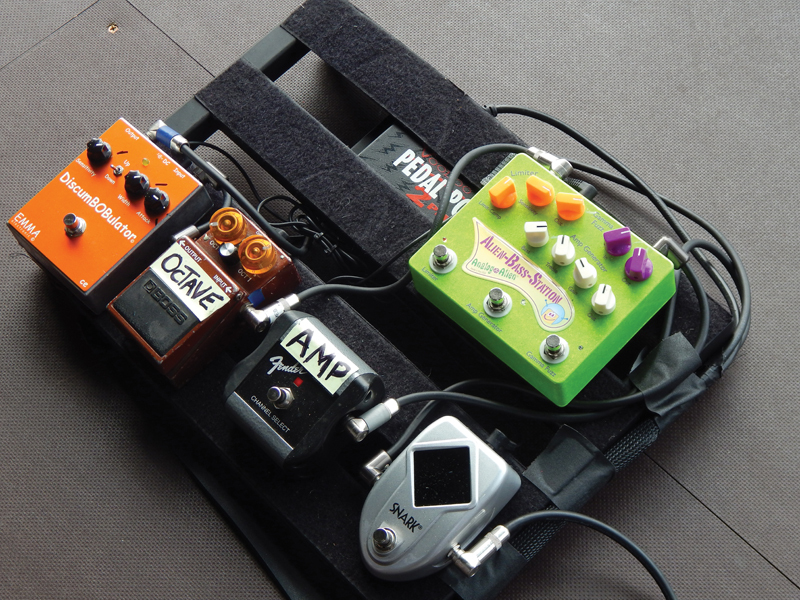 “They make an amp punchier, and where Pete stands will reach about 92dB. 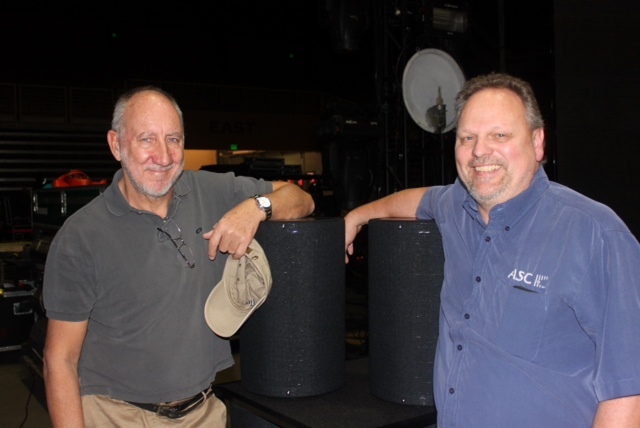 The large 16-inch traps are 55Hz absorption, but if you turn the trap around, it will exceed 400Hz diffusive.” Pete used four of them for the Hyde Park gig, and Tim used a plan layout showing the precise placement for this gig. 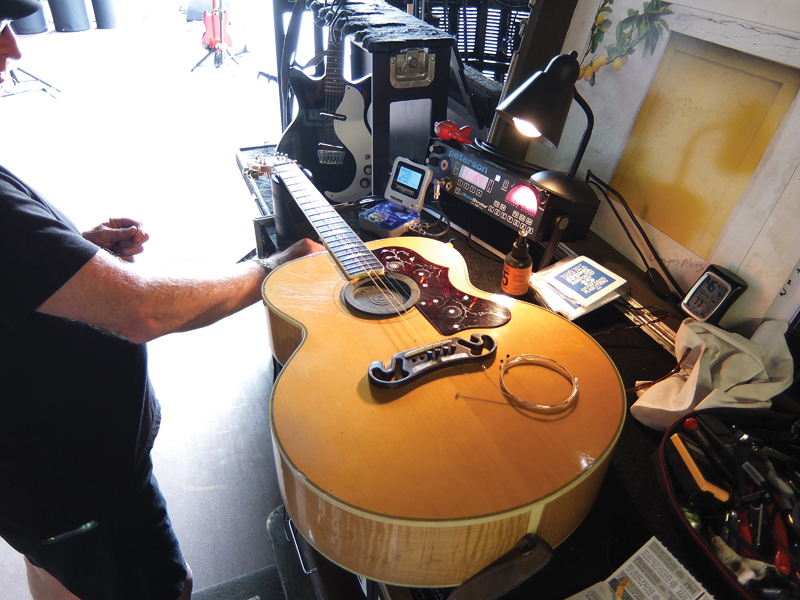 I meet Michael Kaye, who looks after Pino’s backline. He’s another top-pedigree individual: Michael’s worked with Stephen Stills, Don Henley, Megadeth, Prince and many others. Palladino has a similar TubeTrap lay-out, but placed more at the sides of his speakers, separating him from Zak on drums and Roger centre-stage. These traps are positioned to eliminate excessive build-up of bass frequencies. Kaye shows me one of Pino’s bass guitars; it’s Pino’s own Fender Custom Shop Signature P-Bass, based on an original 1962 Precision. I notice straightaway on the top edge of the headstock, a white piece of tape with the word `pinky’ written on it. The bass has a lightweight alder body that has a distressed finish, which is nitrocellulose. It has a C-shape quarter-sawn straight-grain maple neck. The rosewood fingerboard has the standard 34-inch scale length, with a ‘board radius of 7.25 inches and a nut width of 1.75 inches (44.45mm). There are 20 frets, that are very well fitted with dot inlays and a vintage-style split single-coil Precision Bass pickup.It has a master volume and tone control, with a four-saddle American vintage bridge, and the aged nickel/chrome hardware, that has been oxidised, looks great. The scratchplate is the four-ply tortoiseshell type, and there are knurled flat-top control knobs. There is a vintage-style slotted truss rod nut and the aged plastic parts finish it off. The aged lacquer effect is extremely well done. 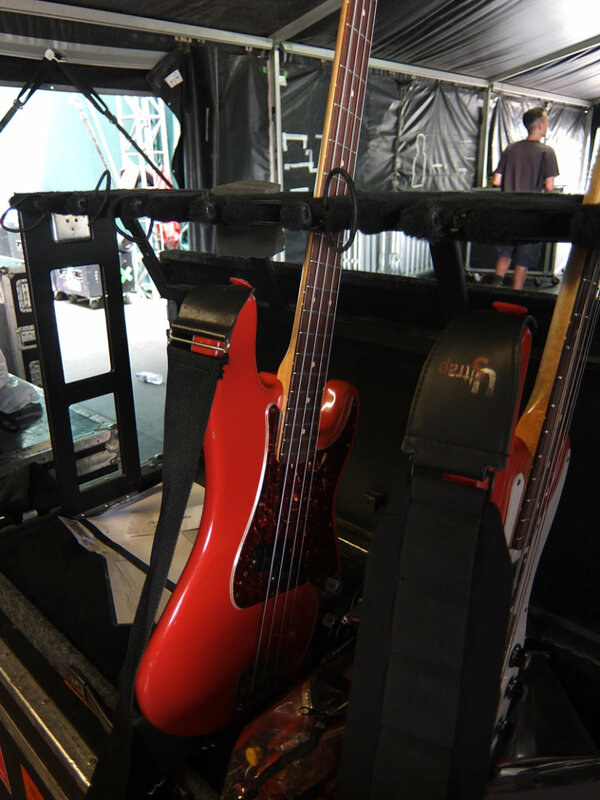 Mike then shows me Palladino’s guitar rack and pulls out his second bass. This model appears to have two old Gibson Thunderbird pickups fitted with stainless steel covers. He then takes me to another flightcase, and inside is a small softcase housing Analog Alien effects; there’s a Rumble Seat drive/delay/reverb, which was recommended to both Palladino and Simon Townshend by Joe Walsh. 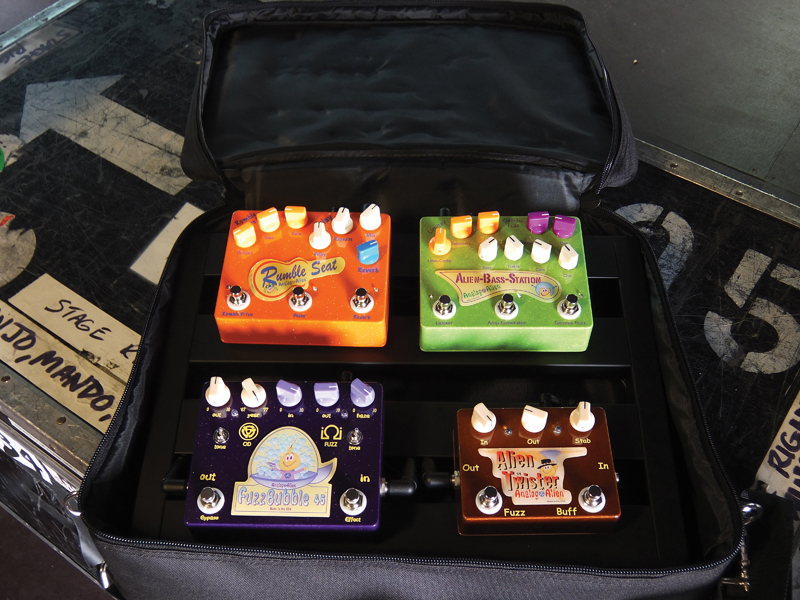 In addition, there’s an Alien Bass Station, a FuzzBubble-45 and an Alien Twister Analogue Fuzz. 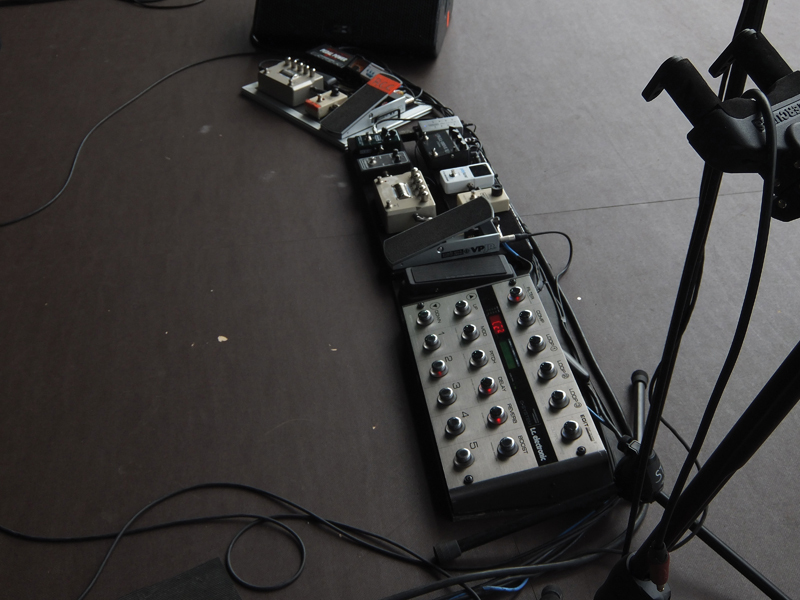 Effects on his main board are an Emma DiscomBOBulator, which is an enevelope filter/auto-wah, a Boss Octave pedal and another Alien Bass Station unit. There’s also an amp channel switcher and a Snark tuner. 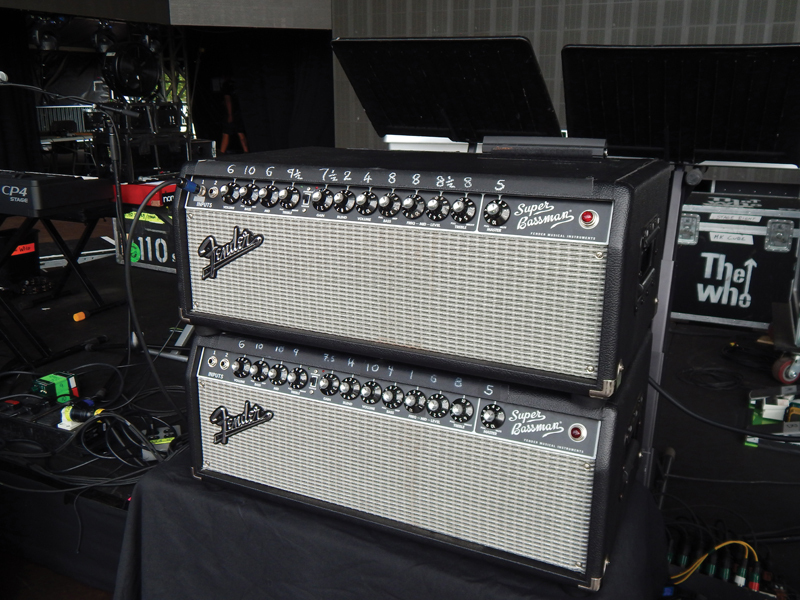 Palladino uses Fender Super Bassman amps. 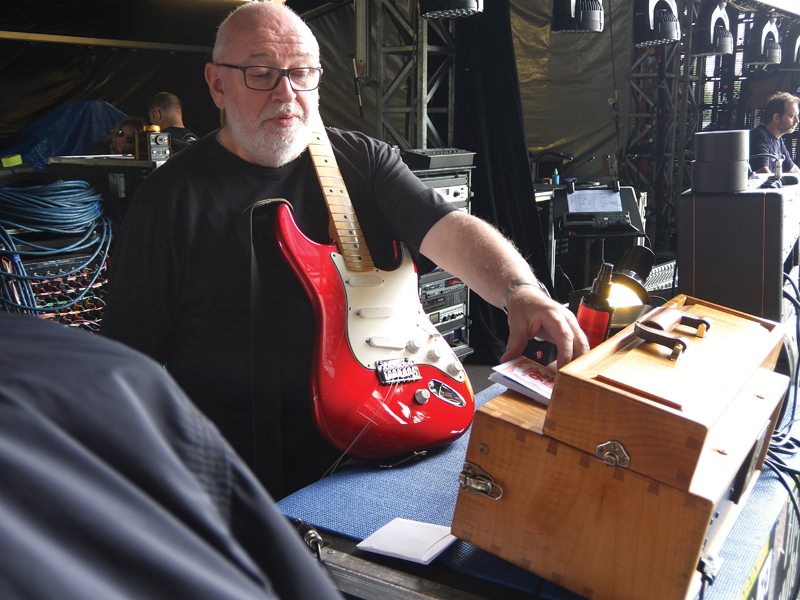 Moving on, I then meet `Binky’; he deals with all the onstage technical duties for Roger Daltrey and Simon Townshend. Another guy with experience of working with the big guns, he’s worked with Stone The Crows, Les Harvey, Bryan Adams, Emperor Rosko and Talking Heads. Binky is working on Simon’s Gibson J-200, and I notice the bone bridge saddle is particularly large and very highly polished. I also note that the strings do not sit in grooves on the bridge saddle. There seems to be a misconception that the bridge saddle should be cut with slots to accommodate the strings, but the slots should not be too deep, as this takes away the tone of the guitar, and also causes tuning problems because of the break angle going to the bridge pins. The serial number dates the guitar to July 1997. 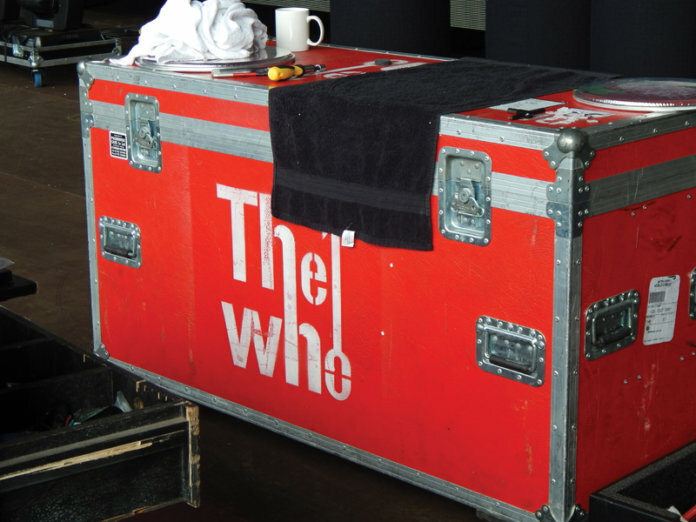 It is likely that, along with two other J-200s, this guitar is used in rotation on The Who’s Quadrophenia tour, which ran from June 1996 to August 1997. In July 1997, Gibson artist rep Tim Bolin presented Pete Townshend with a Fishman Matrix-equipped J-200 acoustic, and I wonder if this could be the one. 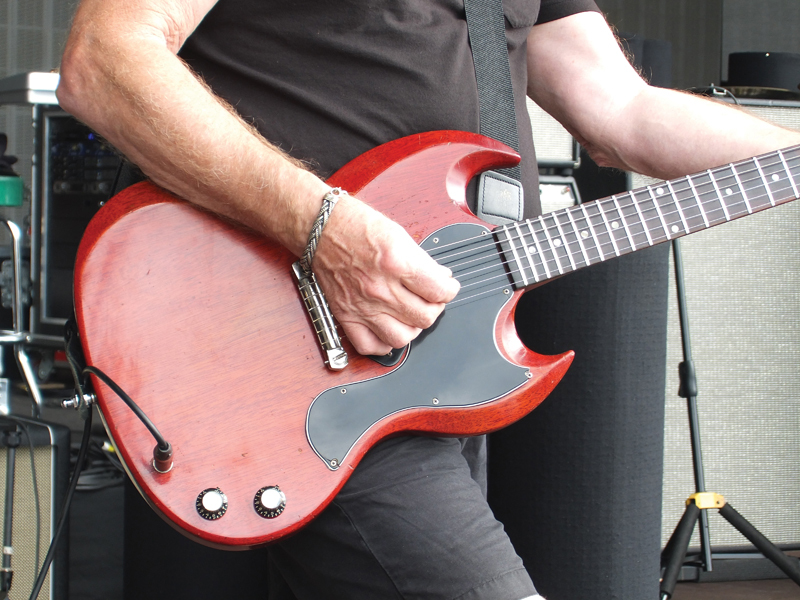 I also take a look at Simon’s 1964 Gibson SG Junior – it is in great condition. I note that the machineheads have been replaced, and there’s a screw missing on the treble side. These are such great guitars, with lots of midrange for such a simple design. Simon is a brilliant guitarist, and provides a solid foundation with The Who’s rhythm section. 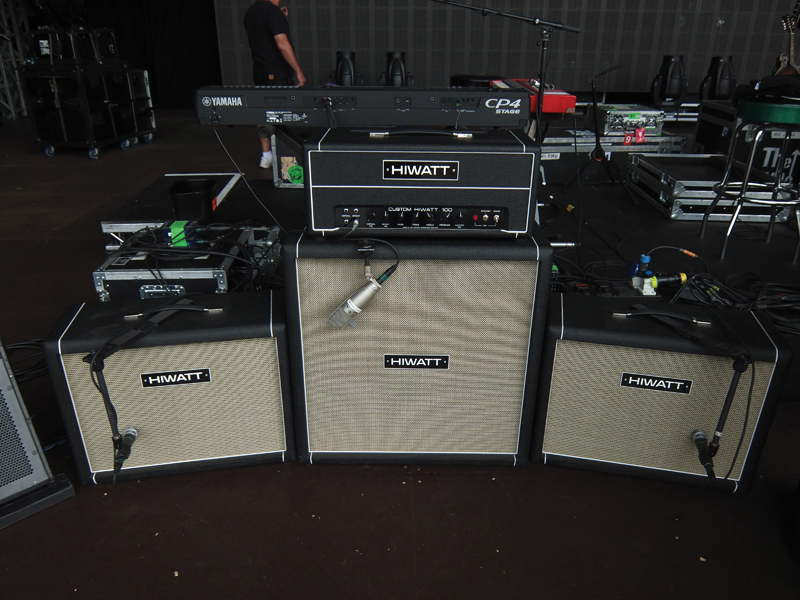 Simon’s rig consists of a Hiwatt Custom 100, one 4×12 cab, two 2×12 cabs and a Fishman acoustic combo. He has an impressive effects arsenal, including a TC Electronic G-System, Blackstar HT-Delay, MXR Micro Amp (x2), TC PolyTune, Compulator by Demeter Amplification, Fulltone Fulldrive, MXR Carbon Copy analogue delay, Boss TU-12H Tuner, two volume pedals and a wah. We guitarists are constantly looking to get ‘that’ sound from our instruments, a signature tone that defines us as individuals. Whether you play flamenco, jazz, funk or rock, with four or six strings, if you look at a player such as Pete Townshend and try to understand what he achieves with his guitar, it becomes apparent that his finely-tuned stage setup is much more than simply a collection of his favourite gear – it provides a means of expression and a direct line between the artist and his audience. 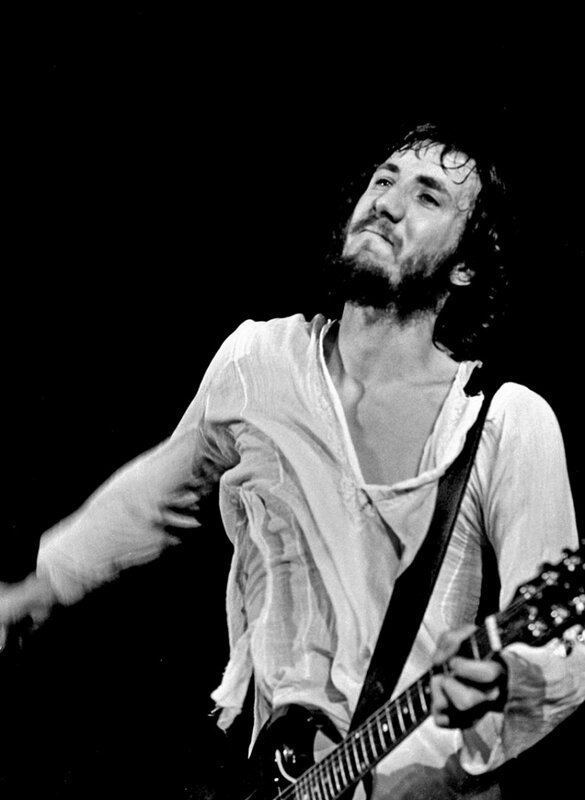 Pete Townshend’s live guitar playing is a force of nature. His control over the wall of sound he creates is phenomenal, as is his command of dynamics – whether he’s playing a solo or arpeggiating in quick succession. And when he hits that A chord, he does it like nobody else can. 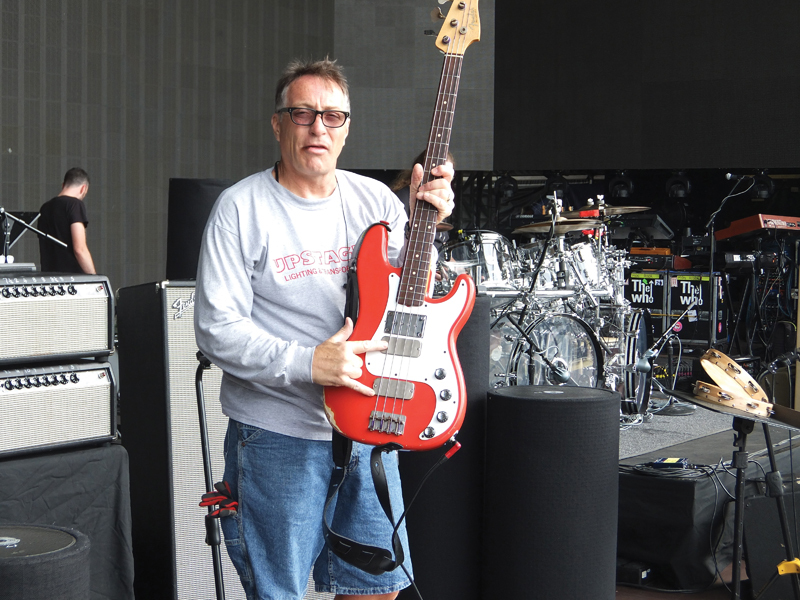 Alan Rogan is a vital link in Townshend’s chain, too; he’s been Pete’s tech for many years, and has a unique understanding of all that is required to keep his guitars in top shape, which in turn helps The Who remain one of the biggest live bands on the planet after more than five decades in the business. Steve Clarke and Guitar & Bass would like to thank Alan Rogan, Chris Klein, Binky, Tim Myer and Michael Kaye for their time and help with this feature.